People often like to ink their bodies with the name of their loved ones like spouses, siblings, children etc. For example, there are tattoos where the person has got several names tattooed on his forearm like Austin, Jacob and Noah and they form a heart figure together. This is a great idea for people who want to get the name of their loved ones tattooed on their bodies. Name tattoos are not always plain and simple and they may have some beautiful decorations and designs around it. Some tattoos show the name written in a beautiful cursive font and the artist adds a few shading effects and fills the font with two colors, like are purple and black, which creates a good amount of contrast. There are unlimited ideas and concepts to make name tattoos, and some are unique concepts that are truly surreal. Some tattoos show an old anchor with a red ribbon around it, the ribbon has the name “Diana” written over it in a cursive font. The artist has immortalized the name in a beautiful way, this is great for people who want to get the name of their dear and departed ones tattooed. The type of font used has a huge impact on the way a tattoo turns out. For example, a huge name tattoo which reads as “Joseph” in a beautiful gothic font like the one found in an old book: if the artist pays special attention to detail and manages to deliver, the result can be truly amazing. The name of a loved one makes a nice meaningful tattoo, sometimes it can be made a little more special with font coloring and a little decoration. On some tattoos we can see the name “Elle” inked onto the forearm, where the artist has used two colors to fill up the font and included four stars in the corners with the same color scheme to further decorate the tattoo. Two names in one tattoo is quite popular as people love to get their spouse’s names inked along with their own. There are beautiful tribal tattoos of a tree which is made into a circle. The artist can blend beautifully two names beautifully into a tree using a matching font, while the shading done on the tree bark makes the art look quite realistic. Dogs are pretty close to their owners and people who have lost their dogs often want to get a tattoo done in remembrance of their truly loyal friend. There are tattoos which show a highly detailed face of a dog with his name written right below it. On these name tattoos the artist can manage to capture the real emotions of the dog and immortalize it through a name tattoo. The forearm is also a great place to get a name tattoo and also the most popular spot for name tattoos for men. Some tattoos feature a very crisp and clear name which has been inked in a clear cursive font. The artist can fill the font with red and black colors to create a good amount of contrast and to make the tattoo stand out. 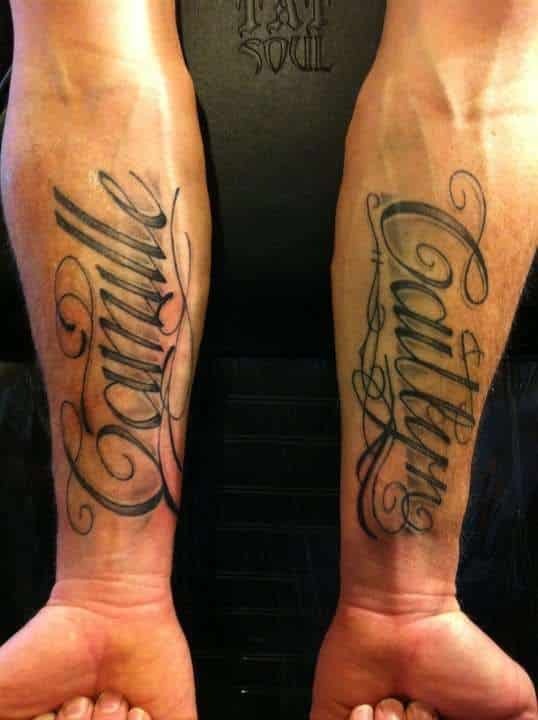 A truly inspiring double hand name tattoo for the forearms, in this image we see the name “Caitlyn and Camille” tattooed in a beautiful cursive font on the forearms of a man. 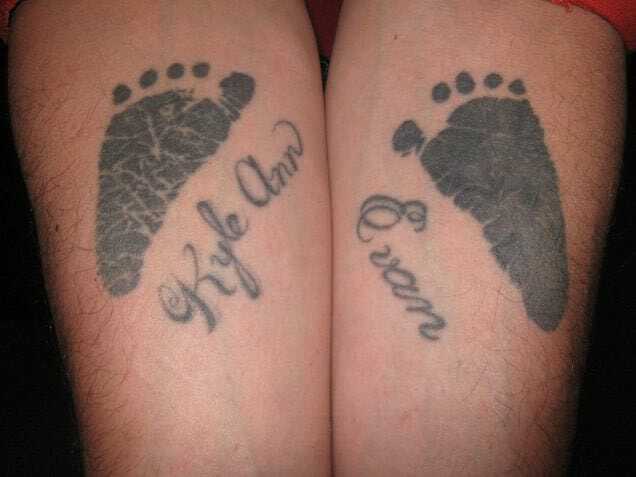 This is a great idea for people who want to get the names of their children on their bodies. 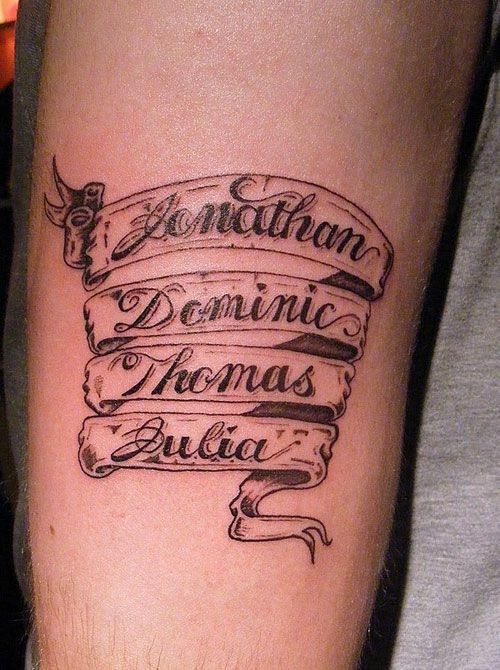 A few artistic effects can change the whole look of a tattoo, here see a tattoo of four names inked one below the other like a flowing scroll. The names could belong to the children of the person or someone whose memory they hold dear, it makes a great name tattoos idea. 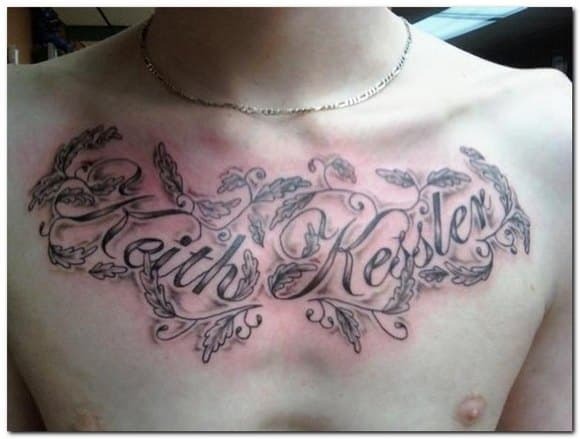 A beautiful example of a name tattoo for the chest, here we see how the artist has beautifully merges with the name “Keith Kessler” with simple leaves and vines that complement the cursive font. The entire length of the chest is covered with this tattoo and it looks magnificent, people who are looking to get their chests inked should definitely consider this idea. 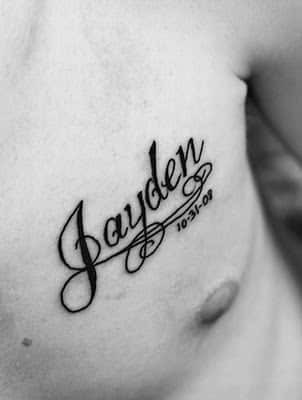 People love to get their names tattooed in unique fonts will find this one interesting, here we have an upper chest tattoo of the name “Jayden” done in a customer vintage font. The person has even included what appears to be a date of birth, this is a rising trend among the people these days. Ribs are a great place to get huge tattoos that cover a large area, here we have a perfect example of a rib tattoo of the name ” Phillip Jason” inked in a huge cursive font. The artist has used just one color in the entire piece to make the tattoo look very sharp and add a good amount of contrast. 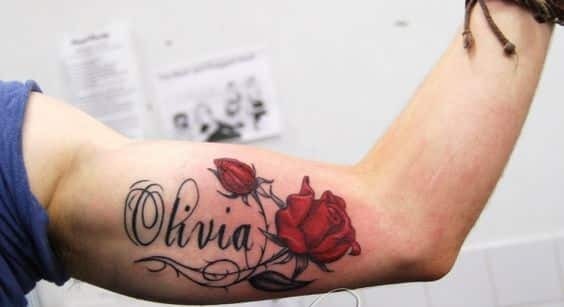 Having the name of your lover or spouse has been a long popular tattoo theme, here we see a similar tattoo where the name “Olivia” is beautifully decorated with two rose and a few thorns on a man’s bicep. This is a great name tattoo design for guys who want to express their love by getting their lover’s names tattooed. 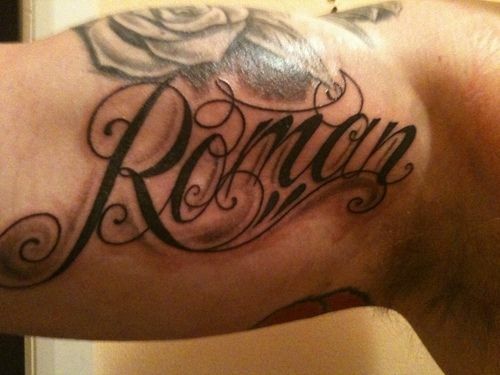 People often come up with their own tattoo concepts and ideas, here we have a similar tattoo of the word “Roman” written in a special custom font and a few shadowing effects. It nicely complements an existing tattoo of a rose on the biceps with its long stroke font, it could be suggesting to the roman way of living which was full of freedom and honour. Small footprint impressions look great together with name tattoos for men, here we have a perfect example of how the footprint impressions compliment a double forearm tattoo of the name “Kyle and Evan”. People who are looking for a brilliant tattoo concept to get their children’s names tattooed should definitely consider this idea. If you have a unique name to get tattooed, you should get it done in your own custom font that compliments the name. 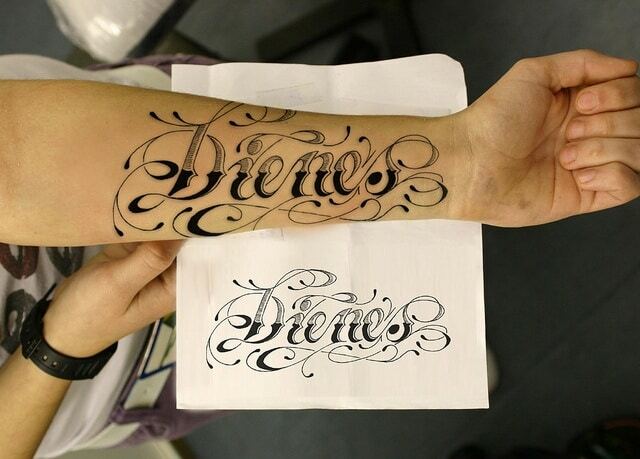 In this tattoo, we see the name “Dienes” is inked in a unique font whose strokes are extended in an artistic way to add to the appeal. People with unique name tattoo ideas should surely consider using such fonts.